You start your day at Discovery Cove with breakfast and lunch as well as snacks. We waited in line, and the chef came out to ensure us that the eggs, ham, and potatoes were all gluten free. We didn't ask about dairy, this time. We just stuck with the potatoes, ham, and fresh fruits. We noticed some more options as we walked through. Lunch was a repeat of waiting in a line (longer line this time) and then a chef came out and helped us with safe food options. We then stepped to the side while the chef prepared our food. We had my favorite French Meadow Bakery brownies (I wish Disney still offered these! LOVE Them!) sauteed veggies, tilapia with tomatoes and onions, rice and peas, and a burger with a sad looking gluten free bun. 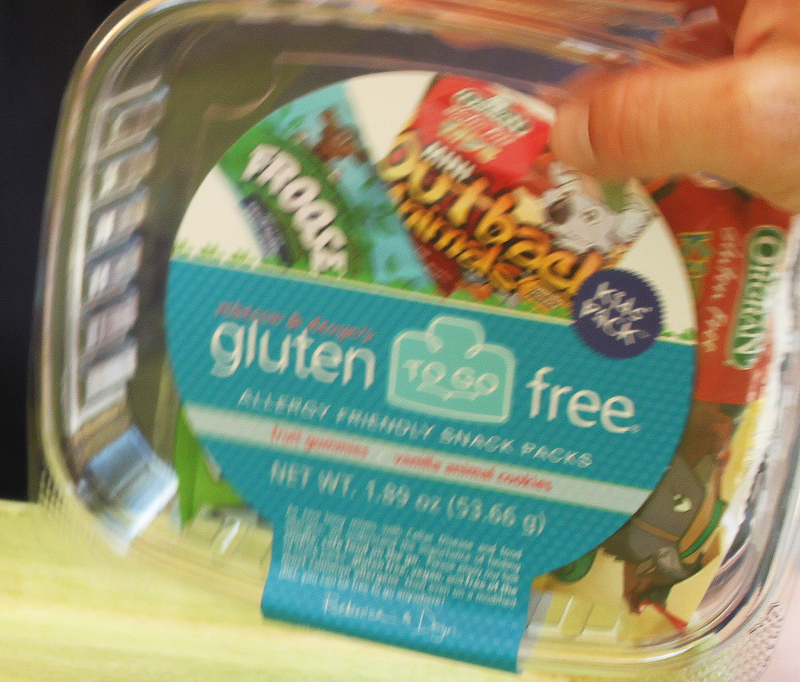 They also offered the Gluten Free to Go allergy box with cookies, sucker, gummies. You could walk up and ask for the snack box any time of day. They also had lays potato chips for snacking and a frozen fruit bar (strawberry) at most drink stands. Seaworld had 3 different Gluten Free To Go snack pack options at their shopping stores. They weren't available everywhere, but we did notice them, so you can ask for help locating. I emailed Seaworld in advance of our trip, and they were unhelpful with any specifics. My questions came back unanswered and I received an auto email response instead. This restaurant was listed as "Allergy Friendly". It is also listed as a fine dining option. The server, like many others we encourted, lacked any training on dealing with allergies. She brought bread to our table. I asked if they offered a gluten free bread and she said no. I was doubtful that this was the case, so I mentioned that the restaurant is advertised as their "allergy friendly" option. She made a comment that it was regarding nut allergies. Again, this seemed doubtful to me, but I didn't push it. She must have asked someone, because another girl came out and said they do have gluten free bread (buns) across the street at their sister eatery, but that they would have to warm them up. Did we want them to do that? Um, yes. That's why I asked. So, off they went. They didn't offer an olive oil for the dairy free among us, but I'm sure they would bring it if you asked. My daughter had steak and mashed potatoes. I had a salad. The food was fine, but nothing outstanding. The service was sub par when compared to Disney, but the staff were all friendly. The reason to dine here is really for the view. You have a beautiful shark tank that takes the entire wall of the restaurant, and that view is what made this meal worthwhile. We went to the Aquatica water park two of the mornings during our trip. You can bring in prepacked snacks such as chips, bars, trail mix. I brought in gluten free bars and chips as well as bottled water. We bought some soda and additional chips while we were there. There was a sit down restaurant, but we didn't eat a full meal here, so I have no review. I noticed they had frozen fruit bars in strawberry that would likely be gluten and dairy free.